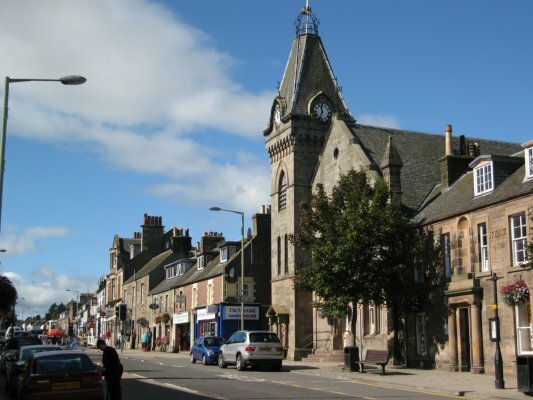 Auchterarder High Street @ High.St - High Street shops and High St businesses. Large Google map of Auchterarder High St.
Auchterarder is a pretty village that is probably best known due to its proximity to Gleneagles. This famous golf resort offers three championship golf courses and the equally famous 5 Star Gleneagles Hotel set in 850 acres of stunning scenery. The High Street is a mile and a half (2.5 km) long, which gives it its popular name of 'Lang Toon'. There are lots of characterful independent shops here to browse. Further afield to the West is the Wallace Monument and Stirling Castle. We took one of the guided tours and our guide really brought the castle and its long history to life. To the North-East is Perth and Scone Palace where Macbeth, Robert the Bruce and Charles II were crowned. A lot of events are held in the grounds throughout the year, including falconry displays and the opportunity to meet characters from history. Check out the Scone Palace website for details.